Protesters hold a banner as Austin DeCoster (left), owner of Wright County Egg, and his son Peter DeCoster testify before the House Oversight and Investigations Subcommittee hearing on the “Outbreak of Salmonella in Eggs” on Capitol Hill in Washington Sept. 22, 2010. SIOUX CITY, Iowa — A three-month prison term for former Iowa egg moguls linked to a 2010 salmonella outbreak that sickened thousands serves as a warning to other food producers, food safety advocates said. U.S. District Court Judge Mark Bennett sentenced Austin “Jack” DeCoster, 81, of Turner, Maine, and Peter DeCoster, 51, of Clarion, Iowa, to three months each in prison for introducing adulterated food into interstate commerce, a misdemeanor punishable by up to a year in prison. The father and son will be required to complete a year of probation following prison and pay $100,000 each. 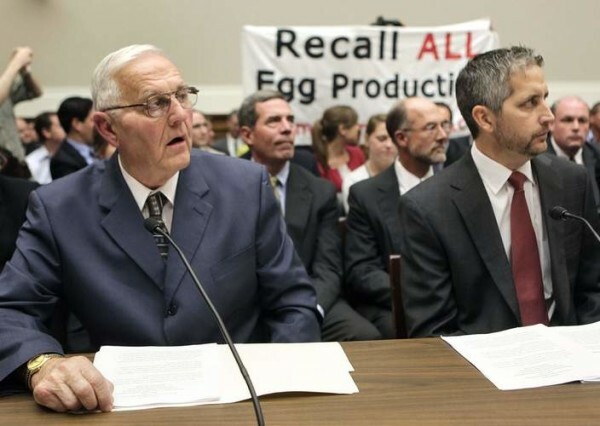 The DeCosters’ former company, Quality Egg LLC, will pay nearly $6.8 million. Bennett handed down the sentence Monday afternoon in Sioux City after several hours of testimony that included accounts of a Texas boy who was hospitalized in 2010 when the salmonella bacterium lodged in his hipbone, said Bill Marler, a Seattle-based attorney who represents people, including the Texas boy, in foodborne illness cases. “The sentence sends an extremely strong message to food producers that the U.S. Attorney is going to look very hard at these kinds of outbreaks,” Marler said in a phone interview Monday. More than 1,900 people across the country reported getting sick from Salmonella enteritidis linked to tainted eggs supplied by Quality Egg, doing business as Wright County Egg, and Hillandale Farms, an Alden, Iowa, operation also managed by the DeCosters. The companies recalled 550 million eggs nationwide. Salmonella causes diarrhea, fever and abdominal cramps that usually last just a few days. But the illness is linked to 19,000 hospitalizations and 380 deaths a year, Atlanta-based Centers for Disease Control and Prevention reported. Quality Egg pleaded guilty in June to bribing public officials and misbranding eggs to make them appear fresher. On April 12, 2010, Quality Egg employees offered a USDA inspector $300 to release eggs for sale that had failed to meet federal standards, according to criminal charges filed in 2012 against Tony Wasmund, a former Quality Egg employee. Wasmund, 63, of Willmar, Minnesota, pleaded guilty in September 2012 to conspiring to bribe an egg inspector. The DeCoster case is one of several recent examples of food producers facing criminal charges after customers became ill.
Georgia brothers Stewart and Michael Parnell were convicted last fall of fraud and conspiracy after their peanut company was linked to a salmonella outbreak that sickened 700 and killed nine. Colorado cantaloupe farmers Ryan and Eric Jensen, also brothers, were sentenced to probation and home detention in January 2014 for their role in a listeria outbreak that killed 33 in 2011, USA Today reported. The DeCosters got out of the egg business after the outbreak, with Jack DeCoster leasing his Iowa farms to Centrum Valley Farms of Alden. Peter DeCoster’s attorney, Stuart Dornan, asked in a sentencing memo filed last week that his client, a father who has done missionary work, be allowed to “avoid the costly and vacuous nature of a prison term” in favor of probation and community service. A sentencing memo filed by Jack DeCoster’s lawyer was sealed. Iowa Gov. Terry Branstad said he was glad to see the DeCosters held accountable.